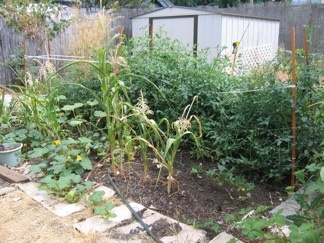 Corn is a bit skimpy but overall my best garden in years with a rich riot of tomatoes in particular. Spring and summer have kept me busy with my organic garden and pro bono work for a local Community Supported Agriculture program, Ashland-Talent Growers CSA. Most of my garden is planted on reclaimed lawn, with grass eliminated chemical-free using cardboard and sheet mulching (great explanation with photos here). You can check out photos with a bit of background here. For the CSA, I’ve been working on website content, a brochure, e-newsletters and a twitter feed. Dominic Allamano set up the wordpress website with initial content developed as a collaborative endeavor. Dig in and enjoy, and grow your own local food and farms! This entry was posted in Agriculture & Food, Communications/PR & Marketing, Freelance Work & Media Placements, Writing & Presentations and tagged food security, gardening, local farms, organic. Bookmark the permalink.